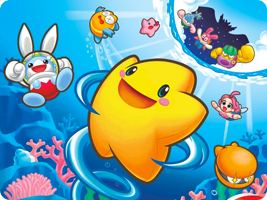 Starting life as an unreleased Game Boy Color title, Starfy eventually debuted on Game Boy Advance in Japan. The series remained Japan exclusive until the fifth game, which was published in the US. Starfy is a star prince from the Pufftop kingdom who adventures with his clam friend Moe through the oceans below, helping anybody who needs assistance, and trying to make his way back to Pufftop.